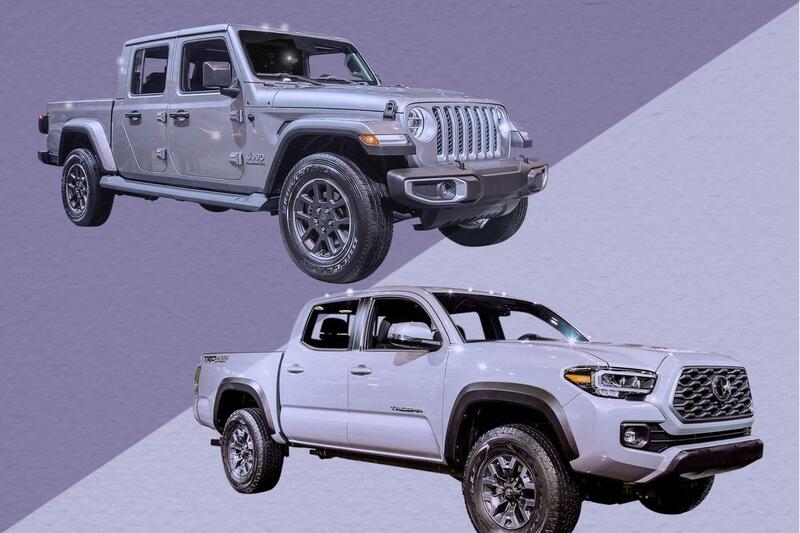 the toyota tacoma long has been the king of mid-size pickup trucks, but it's facing more competition than ever with the return of the 2019 ford ranger and new entrants like the 2020 jeep gladiator. the 2020 toyota tacoma gets some updates for the 2020 model year that include refreshed styling, an available height-adjustable driver's seat and standard apple carplay and android auto smartphone connectivity, but it's largely unchanged from the previous year. the gladiator, meanwhile, is the fulfillment of jeep's long-rumored pickup truck. even if you're not interested in the tacoma's or gladiator's off-road-focused trim levels, it still takes a big step up to get into their cabs. the gladiator overland on the show floor did have running boards, but they're so close to the doorsills that they don't appreciably lower the step-in height, but they also won't likely be ripped off if you decide to venture off-road. what puts the gladiator ahead is its driver-side grab handle on the windshield pillar. the tacoma doesn't have one, and it helps make climbing into the jeep easier. the addition of an available height-adjustable driver's seat makes the tacoma's driving position significantly better, but it also magnifies one of the truck's shortcomings: limited headroom. with the front seat raised, my head was close to the top of the cab, and i was looking at the top of the windshield. headroom is also a problem in the tacoma's backseat, and its backseat is also a little tighter than the gladiator's with a seating position that isn't as comfortable. and with the gladiator's removable roof, the jeep can have unlimited headroom if that's what you want. recent fiat chrysler automobiles interiors, like those in high-end trim levels of the ram 1500[hm16] pickup truck, are impressive, and you can see fca's focus on interior quality in the gladiator, too. the overland trim level's soft-touch door panels, dashboard stitching, low-gloss materials and subtle details result in a cabin that feels both premium and rugged. the tacoma's interior, meanwhile, resembles where jeep was a decade or so ago with a plastic-heavy design even on high-end trims. crew-cab trucks are good for carrying extra people in greater comfort, but they're also good at holding cargo that's too nice for the bed. the gladiator and tacoma take different approaches to backseat versatility. the gladiator's seat cushions can flip up to reveal storage boxes on the floor, and its backrest can also fold flat. the tacoma's seat cushion, meanwhile, flips forward and the backrest folds to create a flat floor. the tacoma also has in-floor storage like the gladiator, but the jeep's configurability gives it the advantage. the gladiator ran the table in this comparison, going four for four in our categories, but we'll have a better sense of how jeep's newest model compares with the mid-size truck class once we've had a chance to drive it, and when gladiator pricing is announced. that chance is coming very soon for us, so be sure to check back for our gladiator driving impressions.